In this eighth-grade humanities lesson, students make frittata and salad with their choice of salad dressing, and discuss the relationship between food choices and the environment with a specific focus on water use and food waste. This is the third in the Debate Plate lesson series, a six-lesson series that focuses on factors and considerations that influence personal food choices and the impacts of those choices. Give examples of how food choices impact the environment. Describe the environmental impact of food waste, and explain how reducing food waste reduces environmental impact. Explain how being informed and self-aware about the environmental impacts of your food choices allows you to exercise agency around the environmental impact of what you eat. Brainstorm inputs that go into making food available for consumption. Match each ingredient in the frittata with the amount of water that was used to produce it and discuss their reactions to how much water goes into one frittata. Reflect on whether learning about the water that goes into a frittata has changed how they think about their own food choices. Collect all the ingredients and tools, and distribute them to the tables. Gather supplies for the Closing. Copy the Frittata and Salad Dressing recipes to hand out. Steam potatoes (if using in frittata). Welcome students back to their second day of Debate Plate in the kitchen. Remind students of the overarching questions of the week: What factors influence what we eat, and what are the impacts of those choices? Prompt students to remember the previous day’s lesson: making red lentil stew and Indian-spiced cabbage slaw and talking about health and nutrition as a lens for thinking about food choices. Introduce the topic of the day: the relationship between what we eat and the environment. When my grandma was my age, she lived with an exotic animal importer. This meant she shared her flat with not only two humans, but an orangutan, a mangabee, a Great Dane, and an ever-rotating cast of small mammals, reptiles, and amphibians. Given her great sense of humor around meals, you’d expect these funny suppers to be really fun, but the truth is, I hated them! Funny suppers were just another name for a dinner where she’d gone and opened the fridge, and pulled out all the odds and ends, leftovers, everything that needed to be eaten before it went bad, and stuck it on the dinner table. Some of it was pretty tame, but some of those funny suppers could get pretty out there with all kinds of weird foods and wild combinations. As a kid, I hated them. But as I’ve gotten older, I’ve actually grown to have a special place in my heart for funny suppers, and even find myself making them sometimes. Many of you probably know someone who hates to waste food—this is the place that funny suppers came from for my grandma. She has a deep appreciation of everything food represents, and she has taught me to feel the same: The food on your plate is more than just food, it also represents all the inputs that went into making to food available to you. Prompt students to brainstorm the inputs that go into producing and processing the food we eat (water, land, nutrients in the soil, human time and labor, fuel for the farm equipment and transportation, electricity for processing and refrigeration, materials for packaging etc.). Today we’re going to focus on water. 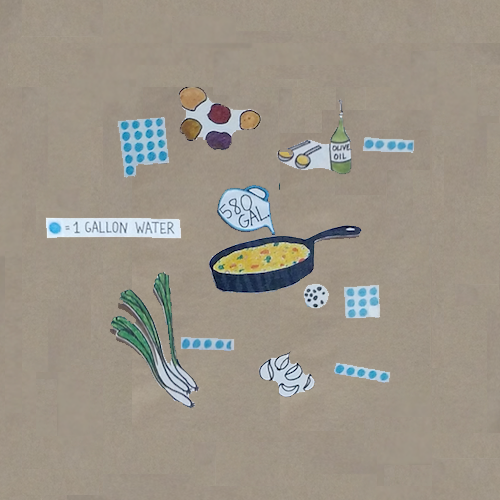 We did some research to find out how much water it takes to produce the ingredients that go into our frittata. Introduce the visual aid—this is just the water used to grow the ingredients, it doesn’t represent any of the water used in processing or cooking. Ask for student volunteers to guess which amount of water corresponds to which ingredient (see “Visual Aid” in the Teaching Notes below for more on how we do this). Once the ingredients have all been matched with a water amount, reveal the total water used to grow the ingredients for one frittata. Food takes a lot of water to grow! Especially animal products. This does not mean that growing and eating food is a waste of water—it simply means that growing food is very water-intensive and educating oneself about the inputs that go into making your food give you greater agency around the environmental impacts of your food choices. For example, now consider the statistic that 40% of food in the US goes to waste. Given what you know now, imagine how much water that represents when you think that when one single egg goes bad, or breaks accidentally, that’s the same as wasting three showers’ worth of water. Being aware of this allows you to be more mindful of food waste. When you reduce waste, you reduce environmental impact. This type of research could be done for any of the inputs we named earlier. When you take into consideration everything that goes into making the food we eat available to us, food starts to seem a whole lot more precious. Every bite is a small miracle. If this resonates at all with you, take a moment to think about this as you eat today. Small-group check-in: What is your favorite way to eat eggs? Introduce jobs for the day in more detail. Split up into cooking jobs. Who do you know that absolutely will not waste food? Why is it important to them not to waste food? What are some strategies they have for not wasting food? What are ways that you or people you know repurpose things that may otherwise be wasted? What kind of environmental education have you had before? How has it made you feel? Do you think environmental education is important? How do you think these topics are best taught? Ask students to rate the food using their fingers from 1 to 5. If there’s time, reflect on discussion from the small table groups. Encourage students to continue reflecting on the idea of waste, and see how much they can notice before Thursday, when we’ll be meeting back in the kitchen. If there’s considerable extra time, play the “Repurpose Brainstorm Game” by putting a plastic yogurt-container lid on each table, and have small groups brainstorm as many ways they can think of to repurpose the lid. Write these ideas down, and afterwards have groups share out. how much water made my frittata? Our goal in every lesson of this Debate Plate lesson series is to support our students’ development as critical, informed, and self-reflective eaters. We want to inspire in them a sense of empowerment around the potential impacts of their food choices. We make every effort to avoid framing our discussions in ways that could shame or overwhelm them. We want to recognize and honor the areas in which our students have agency over their food choices, as well as the areas they don’t have agency or don’t have agency yet. All the components of the "How Much Water Made My Frittata?" visual aid are drawings that we laminated and attached to the poster with a piece of tape on the back. We interact with the visual aid in the Chef Meeting almost like a game show. When students arrive, the image of the frittata is in the center with the ingredients in a circle around it. The different water amounts are jumbled up and attached to the sides of the visual aid. During the Chef Meeting, we ask for students to match the ingredients to their corresponding water amounts. We always start by prompting students to consider the two largest water amounts and ask which two ingredients they think they correspond to and why (cheese and eggs). This helps them to understand that animal products are more water-intensive to produce than vegetable products. From there, sometimes we prompt more guessing, and sometimes we just match the amounts for them. Sometimes we’ll also start the lesson with a couple matched to give them some reference points. At the end, we reveal the total amount of water in one frittata and hold up the cast-iron skillet we’ll be using to cook it in so they can get a sense of the size. We find that having an interactive board is a great way to garner student interest, and makes a lasting impression on students. One of the major takeaways at the end of the week for many students is how much water it takes to grow food. What’s a frittata? For students who are unfamiliar with frittatas, we describe them as a baked omelette, or like a quiche without crust. Eggs: The Frittata recipe calls for 8 to 20 eggs. When making this recipe with a class, we always use eight eggs because that way it cooks a little bit faster. Cheese inside and on top: We encourage students to put some of the cheese in the egg mixture and reserve some to sprinkle on top before putting the frittata in the oven. Cracking an egg: We like to demonstrate how to crack an egg while the students are working. Most students know how, but for the few who are unfamiliar with the skill, it can feel embarrassing and vulnerable to admit that to their group-mates. Raw egg: Show students how to work next to the compost bucket while cracking the eggs so they don’t drip raw egg everywhere. Eggs and cheese: Some students can be hesitant about the combination at first, but even those who profess to hate eggs and cheese together tend to love the frittata. Cooking rates: The recipe says to add the vegetables and herbs at the same time, but this is a good lesson to prompt students to recall the idea of cooking rates and add them to the pan at different times (aromatics, then crunchy, then leafy). Onions: We used bulb onion for this lesson, but when making frittata with sixth graders we often use spring onions instead because it is less irritating to the eyes. Salad dressing: Because there are so many options for dressing, this is an excellent opportunity to encourage students to really use their senses as their guide. We like to show students how to put a little bit of vinegar on their palm to taste so that they can compare the flavors of different vinegars. We also show them how to use a piece of lettuce to dip into the dressing as they work so they can get a better sense of how the dressing will taste on the salad without creating more dirty dishes. Allergies: For students who are allergic to dairy, we reserve all the cheese to sprinkle on top and leave a piece of the frittata cheese-free. For students who are allergic to eggs, we always provide an alternative such as fruit, cheese, or toast. Browning: This lesson is a good opportunity to show students how a little bit of browning on the bottom of the pan can add a lot of flavor. Herbs: We use a variety of herbs in this lesson so that students can taste them and choose which to include in their frittata. Encourage students to use all their senses when choosing the herbs. Testing for doneness: You know the frittata is done when the egg looks solid and doesn’t shake when you shake the pan. Hot sauce and culture: We made multiple hot sauces available to our students during this lesson (Crystal, Tapatío, Cholula, Sriracha). Students often identified very strongly with one or two hot sauces and were very happy to see their own hot sauce because it was an opportunity for them to see their culture represented in the space. Fairness: Sometimes students become anxious when we start cutting the frittata for serving. We find it helps to name that you’re trying to slice the frittata as evenly as you can and that it is very difficult to make it perfect, so please be understanding of that. Frittata for everyone: This year we made frittatas with the sixth and eighth graders. With the sixth graders, we made the lesson more simple by cooking just the frittata without the salad. Table discussion: We’ve found the best conversations around this topic happen when we ask about people students know who have specific practices or habits around waste. Almost every student will have a story about at least one person in their life who hates to waste something—whether it is food, water, clothes, or other things. Engage effectively in a range of collaborative discussions (one-on-one, in groups, and teacher- led) with diverse partners on grade 8 topics, texts, and issues, building on others’ ideas and expressing their own clearly. Demonstrate mastery of knife skills, safety and care using knives from the ESY Toolbox. Choose the right tool for each job at the ESY Cooking Station, anticipate steps of the recipe, and take initiative to cook independently. Demonstrate mastery of a wide variety of cooking techniques, reliably choose the right technique for each job, and compare and contrast technique differences in conversation. In "Eighth Grade Kitchen Rotation"